A traditional Irish tune has the lyrics, "Dilín ó deamhas ó deamhas / Dilín ó deamhas ó dí / Dilín ó deamhas ó deamhas ó deamhas ó / Dilín ó deamhas ó dí" and from the Gaelic is sometimes translated as "Little darling, oh angel, oh angel, little darling, oh angel, oh darling...." The opening word is of two parts, "Díl" as term of endearment, and suffix "ín" meaning "small" or young, while "deamhas" is "angel." 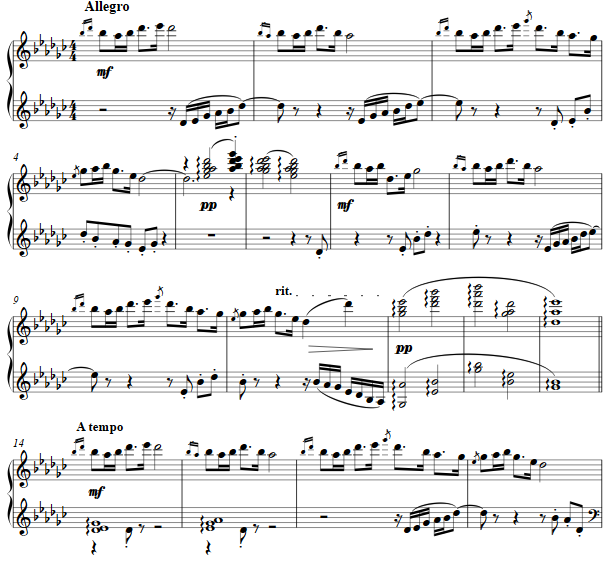 The tune is repeated with varying, sparse counterpoint and then restated as a fugato for the joy of it. As a pentatonic melody the "black keys" of G flat major was chosen.